It’s October and fall is in the air and it’s pear season ya’ll and the French gal in me wanted a taste of an old family recipe my grandma use to make for a dessert for our Sunday family gathering among fabulous homemade pies all cooked in a wood stove I can just smell it right now!! I changed a little to make it my own. Bon Appetit! Preheat oven at 350. Grease a 9 x 2 baking pan and set aside. Soak in warm water the dry cranberries while you peel, core and quarter the pears. In a microwave safe bowl melt 4 tablespoon butter stir in the lemon juice and brown sugar and pour in the bottom of greased pan. Arrange the pear at the bottom of the pan. Next drain the cranberries and sprinkle evenly in the pan. Make the batter by mixing together the butter, eggs, sugar, milk and vanilla. In a separate bowl mix together flour, baking powder, salt and cinnamon. Slowly incorporate the dry ingredients with the wet ingredient until it forms a smooth batter pour on top of pears and bake for 35 to 45 minutes insert toothpick in center of cake to test if cake is done if toothpick is clean it’s done. Let it cool on a wire rack for 10 minutes. Run a knife around the edge of the pan. Turn a cake plate upside down on top of the cake pan and, using pot holders; carefully invert the cake pan onto the plate. 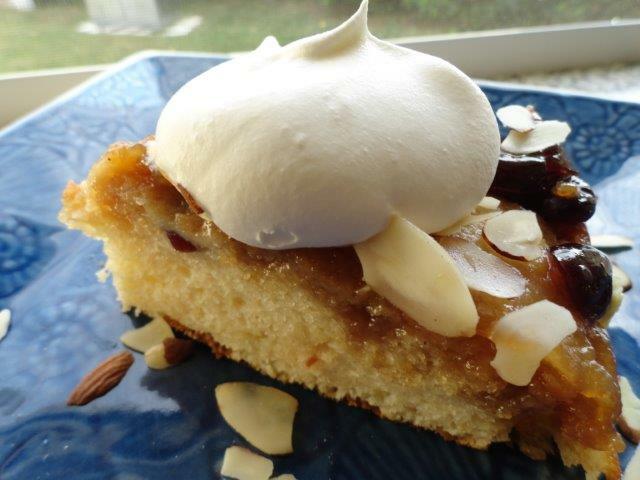 Serve with whipped cream or ice cream and garnish with sliced almonds.